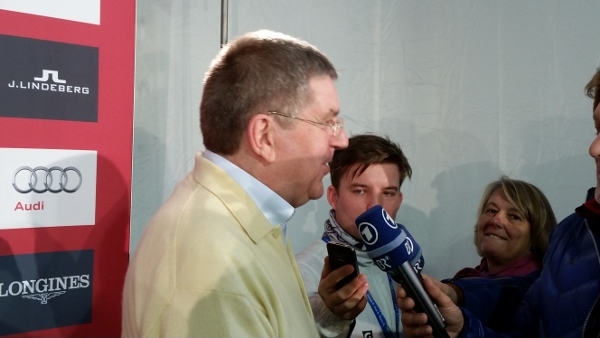 International Olympic Committee President Thomas Bach speaks to reporters Tuesday in Beaver Creek (David O. Williams photo). It’s clear that the Winter Olympics won out in a power struggle over the timing of major international sporting events when a task force for FIFA, the international governing body of soccer, decided this week to recommend moving the 2022 Qatar Word Cup to November and December. The multi-week soccer event that occurs every four years typically is scheduled for June, but temperatures in Qatar top 107 Fahrenheit that time of year, a safety concern for both spectators and athletes. January and February are the coolest months, with monthly averages in the low 70s. But earlier this month in Beaver Creek at the 2015 Alpine World Ski Championships, International Olympic Committee President Thomas Bach made it clear that time frame was off limits owing to the 2022 Winter Olympics being held in either Beijing or Almaty, Kazakhstan. “We have been talking about this with FIFA for quite a long time and we have the commitment of the FIFA president that this will not happen, that there will be no clash, because this is in the mutual interest,” Bach said of the potential 2022 World Cup conflict. “It would be a lose-lose situation. Neither the World Cup or the Olympic Winter Games would get the full attention they deserve. FIFA’s executive committee still has to ratify the move to November and December, when temperatures still average 86 and 77 respectively. Football leagues across the world are already lamenting the scheduling disruption, according to the BBC. The 2022 Winter Olympics may be lightly viewed in western nations, where the third consecutive Winter Games in Asia (if you count Sochi as being located on that continent) will again lead to time-zone broadcasting issues. Several European cities dropped out of contention after the massive costs associated with the Sochi Games. Bach said newly adopted sustainability and affordability guidelines have spurred greater interest in hosting the 2026 Winter Olympics. There was widespread speculation the IOC would reopen the bidding process after two less-than-ideal candidates emerged as the only nations still standing, but that won’t happen. “The IOC will not reopen the 2022 bidding process; we have two candidate cities which are Beijing and Almaty,” IOC spokeswoman Rachel Rominger confirmed in an email. Under the new Olympic Agenda 2020, United States Ski and Snowboard Association CEO Tiger Shaw says there’s a great deal more flexibility, including the possibility of splitting bids (and costs) between multiple cities and even states. A U.S. bid for either the 2026 or 2030 Winter Olympics is contingent on the success or failure of a bid by Boston for the 2024 Summer Olympics. The United States Olympic Committee has made it clear that the Summer Games are its top priority since the U.S. last hosted them in 1996 in Atlanta, compared to 2002 for the Winter Games in Salt Lake City.